Pictured front center is eighth-grader Shannon Douglas. Behind him is eighth-grader Kendrick Stevenson. Back row, from left, are eighth-graders Ja’Cory Coleman, Donovan Blake, and Terrance Lowe, seventh-grader Nymon Johnson, eighth-grader Jarrod Ford Jr. and seventh-grader Kevin Massengille. DESOTO—Today I’d like to take this moment to send a shout out to a few very special young men. These young gentlemen, of their own volition, have started to meet with me each morning in my office at DeSoto East Middle School, to get the day started off right. Of the many roles I serve in this Earth, one that I cherish especially is that of security officer in the public school system, where there’s no shortage of young people in need of — and most importantly, wanting — more mentors. They go by names such as Ricky Brooks Jr., Jarrod Ford, Ja’Cory Coleman Jr., Donovan Blake, and Nikovian Calhoun. Then there are Shannon Douglas, Kendrick Stevenson, Kevin Massengille, Nymon Johnson, Terrance Lowe, James Linscome, and James Waggoner, just to name a few. We’ve recently started meeting just before their first class of each day for an encouraging and empowering pep talk. 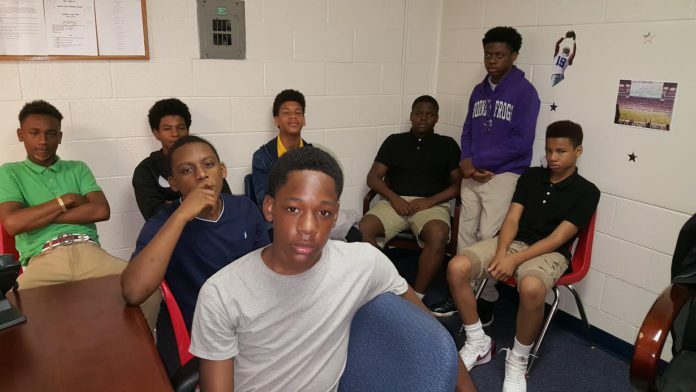 With the endorsement of Brandon Ward, head principal at East, these 12 young gentlemen come to me and we talk about life and things they can do to be more productive as students on our campus and citizens in our community. I’ve posed challenges to them that each has accepted — challenges such as getting to class on time, improving academically and how they relate to their peers. They’ve committed themselves to changing how they relate to authority figures at school and their parents and guardians at home. I’m here for them as their accountability partner, to help ensure that they stay true to themselves, first. I’ve found that when one is true to himself, it becomes easier to be true to others with whom he communicates. Like everyone else in this world, including myself, these young men have issues that they ask for help sorting through. Sometimes improperly dealing with those issues have gotten them sent to the principal’s or assistant principals’ offices. But for these guys to take ownership of things within their control that they may have mishandled is huge. They’re learning, or it’s being reinforced, that one of the main characteristics of being a man is accepting the consequences that come with having made poor choices. In other words, fight disrespect with kindness, with meekness. When you do that, it pretty much forces the other person, whether it’s another student or an adult, to positively change the way he or she interacts with you. Each of these young men has accepted the charge to make it a point to be on the A-B Honor Roll by the time school recesses for the summer on June 2. I call them East’s “Junior Administrators,” meaning when they see other students making poor choices they’ll speak out against those decisions. But always in a meek-spirited manner. When they see other young people doing positive things on campus, they’ll hand out compliments. Perhaps the thing I’m most proud of about these guys is that they’ve gotten to where they look forward to our daily “pep rallies,” so to speak. They’re discovering more and more the greatness within themselves. The gleam in their eyes suggests that they’re pleased with what they’re learning about themselves. This week’s column, by the way, is not just about what these young people are doing, but it’s also shining the spotlight on the wonderful support these youngsters are getting from East’s faculty and staff. What’s going on here is a concerted effort by Mr. Ward and other members of his staff to launch the students at East to unparalleled greatness. In addition to being a dedicated educator, Donald Lee is a published author, minister and columnist. Follow him on Twitter at @donaldj_lee. He may be contacted at leedonaldj@gmail.com.